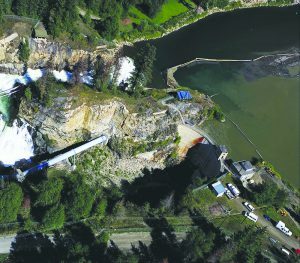 The FWCP has endorsed a proposal to improve fish passage at the Wilsey Dam on the Shuswap River near Vernon. 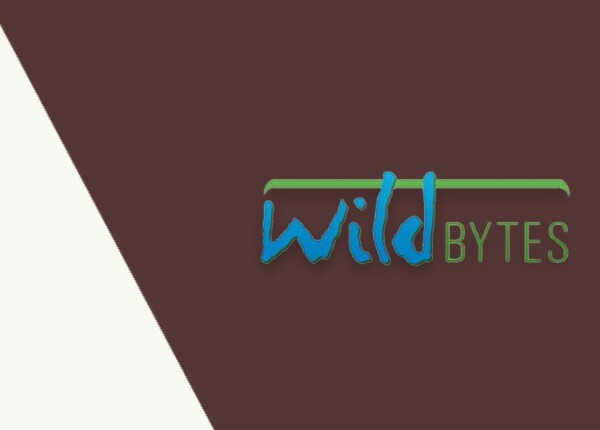 The proposal was developed by the Wilsey Dam Fish Passage Committee with funding from the FWCP for environmental and technical feasibility studies. Construction of the dam in 1929 blocked the upstream passage of salmon including Chinook, Coho and Sockeye. With endorsement of the FWCP’s Coastal Region Board, the Wilsey Dam fish passage proposal moves to step six in BC Hydro’s seven-step fish passage decision framework where further analysis and an assessment of the environmental, financial, and technical elements of the proposal, as well as the social benefits, will be conducted. If the results of this step are positive, BC Hydro’s Board of Directors will review the proposal for acceptance. The FWCP is also currently funding fish passage feasibility studies in the Alouette and Coquitlam river watersheds. In the Salmon River watershed, the FWCP has also funded environmental and technical feasibility studies. In the end with additional partner contributions, the process helped facilitate First Nations’ engagement, as well as agency and stakeholder input. In 2017, the Salmon River Diversion dam was removed and the river bed was rehabilitated providing migrating Coho, Chinook and Steelhead unimpeded access to about 40 km of upstream good quality habitat. The final report Plan for Fish Passage at Wilsey Dam (May 2018) is available. BC Hydro uses a seven-step Fish Passage Decision Framework to navigate improved fish passage at BC Hydro dams and generating stations. Since 2008, the FWCP has been funding groups in the Alouette, Coquitlam, Shuswap, and Salmon River watersheds for fish passage feasibility studies. 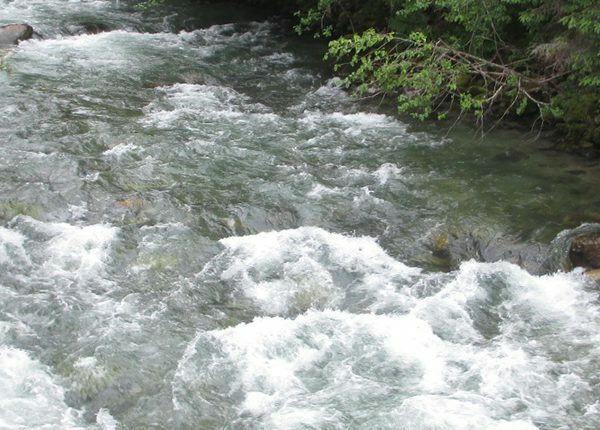 In 2018–2019, with funding from the FWCP, First Nations, stewardship groups, and others are continuing to work on improving fish passage in watersheds impacted by BC Hydro dams. Each summer, Sockeye Salmon that reach the fish fence on the Alouette River in Maple Ridge, are collected and then transported upstream of the dam, where they are released to spawn. Historically Chinook, Chum, Sockeye, Coho, and Pink Salmon, plus Steelhead, used the Alouette River. 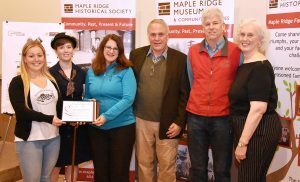 The Alouette River Management Society received a Heritage Award for their efforts to improve fish passage. That’s how upstream fish passage is handled now in this Lower Mainland watershed. But the Alouette River Management Society (ARMS) wants to further improve fish passage. Despite the work of ARMS, returns have been limited. Since 2007, 331 adult Sockeye have returned. In the Coquitlam River watershed, the focus is on getting Sockeye smolts to imprint on the reservoir water, leave the reservoir, and then return to spawn. 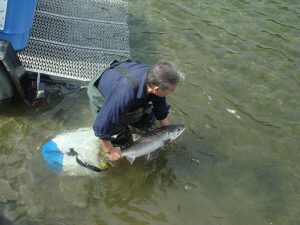 The Kwikwetlem Sockeye Restoration Program anticipates a portion of the 5,000 of the hatchery-reared smolts released in spring 2017, will return to spawn in 2019. Previously, in 2017, just two adult Sockeye returned to spawn. In 2008, the first Sockeye was released into the Coquitlam Reservoir after 100 years. “We need to increase the number of smolts that leave the reservoir and our fish passage plan is looking at physical to options achieve this,” says Dr. Craig Orr. FWCP has been funding the Kwikwetlem Sockeye Restoration Program in its pursuit of fish passage since 2005. 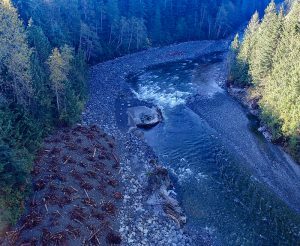 In 2017, the Salmon River Diversion dam was removed and the river bed was rehabilitated providing migrating Coho, Chinook and Steelhead unimpeded access to about 40 km of upstream good quality habitat. The Salmon River Diversion dam was removed in 2017. Around 2008, work began to determine the potential benefits of improving fish passage at the facility. FWCP’s funding of environmental and technical feasibility studies, along with other partner contributions, helped facilitate First Nations’ engagement, as well as agency and stakeholder input. “We worked towards the common goal for good fish passage. We were excited to be part of it, and really, what the end result means for fish,” says Brian Assu, Project Co-Lead, Chief for We Wai Kai Nation, and member of the FWCP’s Coastal Region Board. 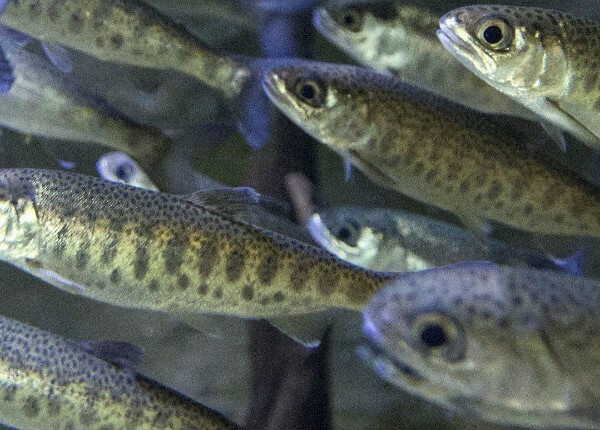 Proponents looking for an FWCP grant to evaluate opportunities to restore fish production above BC Hydro facilities that previously blocked fish passage are required to work through the Fish Passage Decision Framework, approved by the Fish, Wildlife & Hydro Policy Committee in 2008 and revised in 2017.